Why Should I Feed Raw? With the switch to feeding raw food, there comes knowledge and a passion for healthy eating. It’s something that you becomes proud of and it becomes a huge part of your life. In my house, we wake up in the morning and we feed all of our pets. I’m betting if you’re reading this you do the same thing. But instead of scooping a cup of dry food into our pets bowls, we pull thawed, raw meat patties or nuggets out of the fridge. A lot of people wonder why we go through the trouble. They're sure that their pet is thriving on its current diet and wonder why they should make a change. It’s very easy to get stuck feeding the same food to your pet day after day, either out of a fear of messing with what appears to be working or concern that, by adding to your pet's food, they may not like the switch or perhaps it may mess with their digestion. But there doesn’t have to be fear associated with trying new foods. 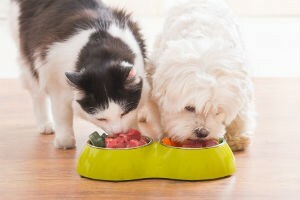 There is so much information out there about raw food and many people aren’t sure where to start when it comes to improving their pet's diet. With raw food, it's easy to add just a little at a time and begin to see how much your pet will benefit. Most noted benefits are a shiny coat, cleaner teeth, and bright eyes. When introducing raw food to a pet some people make the mistake of transitioning too quickly which may result in loose stool. This is not a reason to turn away from raw but rather to simply slow down the transition and allow your pet's body the time to adapt. For anyone with digestive concerns, your pet's body is going to know exactly how to break down and use the raw foods they way their bodies are designed to, from the enzymes they produce to the shorter length of their digestive tract. With the switch to feeding raw food to our cats and dogs there comes knowledge and a passion for healthy eating. It’s something that you becomes proud of and it becomes a huge part of your life. I’ve always told my customers over the years that feeding raw is a lifestyle and I stand by that. Raw feeders do it because of the passion we have for keeping our pets in great health. We know that our pets will have a longer lifespan and experience significantly fewer health issues. Imagine how great you would feel and how your body would thrive if you ate a clean minimally-processed diet made up of only whole foods. All of these concepts apply to our pets. In today’s fast-paced times we’ve grown to rely on fast and more efficient ways of doing things. This has led to life-long diets of dry and canned food. While raw is new to a lot of people it's not a new concept. In fact, it's been around longer than dry food. Many years ago, dry and canned food were created out of convenience. It’s time to slow down and add some whole raw foods back into their bowls and see our pets flourish. There is a feeling I have when I fill my pets' bowls with their raw food and supplements - it the comfort of knowing that I’m offering species-appropriate foods. If you had a road map of the perfect health life plan for you pets you would want to follow it, right? Unfortunately, there isn’t one, we have to create it. We have to learn what works best for our pets and do the best we can. Even if that means just adding some raw into their diet. By doing the best we can and and putting our hearts and effort into keeping our furry best friends healthy, we will lead a much fuller life together. When I look at my own pets I see bright, clear eyes, shiny coats, and clean teeth. These are all amazing things but they aren’t the only things. I see happy animals, I see dogs who exude health and good energy. My first goal in feeding raw food is to nourish the soul.